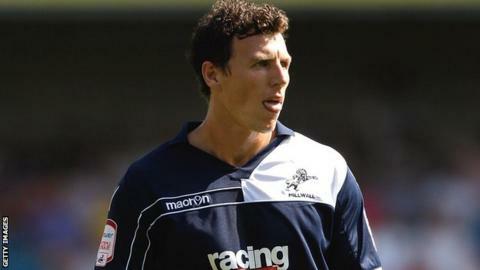 Darius Henderson scored a 90th minute winner to move Millwall three points above the relegation zone and pile more pressure on Bolton boss Owen Coyle. Danny Shittu's header was disallowed for a push on Adam Bogdan but Henderson put the hosts ahead with a deflected shot from the edge of the box. Bolton drew level when a Chris Eagles free-kick found its way through the wall, but Eagles then missed a penalty. They were punished when Henderson drove a finish past Bogdan to win it. It left Bolton, who were relegated from the Premier League last season, 18th in the Championship without a win in three matches. Millwall could have taken the lead when a mistake by Stephen Warnock let in James Henry, but when his cross came in Matt Mills managed to get a foot in ahead of Chris Wood. From the corner Shittu nodded Henry's cross into the net, but the effort was ruled out for a foul on goalkeeper Bogdan. The hosts did take the lead in the 17th minute as Henderson's scuffed strike wrong-footed Bogdan. Bolton wanted a penalty when Kevin Davies' goalbound shot appeared to be blocked by the hand of Mark Beevers, but referee Gavin Ward signalled for a corner. Eagles saw a drive tipped over by David Forde and Wood headed inches wide before Bolton drew level. Liam Trotter fouled Mark Davies on the edge of the box and Eagles fired his set piece through the wall and past Forde. Wanderers had the chance to go ahead when Jimmy Abdou slid in on Eagles, but the winger blazed his spot kick over the bar. They fell to a fourth away defeat of the season when Henderson got free down the left and drove his shot across Bogdan. "It's a very good home win and also makes our last two points away from home look very good. "The penalty was a turning point. It got our crowd going and the players responded. "The highlight for me was that the relationship between the players and crowd was there, we brought them into play with our good play and must continue to do that. That's the key to a good home record and the key to being Millwall." "I'm not naive, that's the nature of football, I know how it works. It's up to us to win games and if we don't I'm the same as any manager in the country. "The bottom line is we missed a penalty and then shot ourselves in the foot. "The second half was better, we got back in it and then had a penalty. "If it had gone in I think we'd have gone on to win the game, but we spurned the opportunity and got bitten on the bum at the end, so it's hard to take."